HUD's latest approach keeps it alive — barely — but makes it much less "public," writes Jake Blumgart. Sidebar by Woo Kim. Each city may need a slightly different approach. 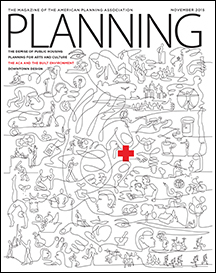 A Planning Practice story by Christine Kreyling. Erick Mertz and Jim Sellen contribute sidebars. How does the ACA affect the relationship between hospitals and communities? Tom Sieniewicz, Keith Walzak, and Donald G. Bellefeuille answer. Sidebar by C.J. Eisenbarth Hager. Eastern and western styles differ but align in important ways, report Tom Daniels and Jack Wright. Lessons from the industrial landscape parks of Germany's Ruhr Valley. Katharine Burgess is on the scene. The capital of Azerbaijan bridges past and future. A personal account from Alan P. Mammoser. An excerpt from Randall Arendt's new book, Rural by Design. Resiliency in NOLA, urban wetlands. The nerve of traffic modeling. Cover: Healthy communities. Illustration by Felix Sockwell, felixsockwell.com.